This breakout board contains a 68-pin Mini D Ribbon (MDR) Female connector. Each of the 68 connector pins is brought out to screw terminal blocks, allowing connections to be made easily. Each pin is also brought to solder pads (2 per pin) at 0.1" spacing, allowing easy addition of 0.1" pin headers or other components. Please note that the breakout boards are manufactured with a connection between each connector pin and the corresponding terminal block position; no soldering of any type is necessary. The solder pads simply provide an area for making optional connections to additional headers or other components. The connector used on this product goes by several different names, including Mini D Ribbon, Mini Delta Ribbon, MDR, Mini Centronics, Half-Pitch Centronics, HPCN, HPCN68, Half-Pitch CN, and Micro Centronics. It is also occasionally referred to as a SCSI2 connector, though that is not typically a proper use of the term. Sometimes these 68-pin MDR connectors are called Mini 68 or SCSI-III connectors. However, be aware that there is some confusion in the terms commonly used. 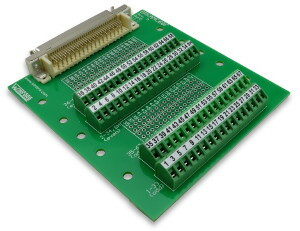 The manufacturer and model of the connector on these breakout boards is listed below, making it possible to carefully compare the connector on your application to the connector used on these breakout boards. Contact Winford Engineering for any needed assistance. Note: Other threaded insert options may be available. Please contact Winford Engineering to discuss any needs you have. Winford Engineering offers 68-pin MDR cables (shown below) which are compatible with these breakout boards. This breakout board is general-purpose in nature and useful when interfacing to a variety of equipment. There is some use of this 68-pin MDR connector in the data aquisition and instrumentation fields. 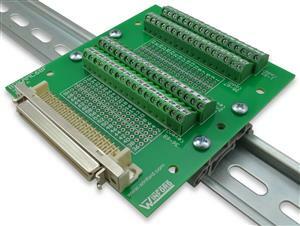 This breakout board is designed to work with this type of system to split out I/O signals for connection to other equipment. Examples include the GUNT 'FL 151' Multi-Channel Measuring Amplifier. Approximate dimensions: 3.84" x 3.5"